If history is anything to go by, Russell T. Davies will try to top all his previous gonzo conclusions with his final Doctor Who, "The End Of Time." Is it too much to hope he's learned from his past mistakes? Though there's absolutely no denying Davies has successfully forged a massive popular (and, to a slightly lesser extent, critical) success with his revival of Doctor Who, I'm sorry to say that I'm still not entirely convinced he's all that good at writing episodes of Doctor Who. Of the twenty-two stories he's written for the new series (not counting his two recent collaborations), I'd only consider "Midnight" a classic, although I could maybe be talked into counting "Utopia" as well, if only for nostalgia value. The rest are a mix of solid but unremarkable filler ("The Long Game", "Smith and Jones"), weird morality plays with seriously muddled points ("Boomtown", "Love & Monsters"), decent premises let down by gratingly absurd setpieces ("Tooth & Claw", "Gridlock"), and fat jokes ("Aliens of London", "Partners in Crime"). Oh, and the finales. But more on them in a second. There have has more than enough written over the last five years attacking Davies, and I'm honestly not interested in adding to that tally. Suffice it to say that while he's not my favorite writer, I still respect what he's done for the program, I do think he's been a fantastic executive producer and showrunner, and "Midnight" almost makes up for all the other missteps. There are definitely some things Davies knows how to do really well. But if there's one thing I'm really not sure he knows how to do at all, it's epic series finales. 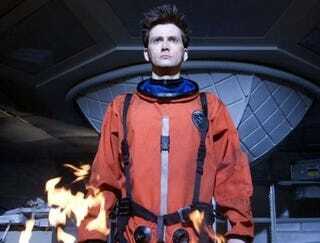 Which gives me serious pause as we head into the biggest, craziest, most epic finale of them all, as both he and David Tennant unfold their swansong on Doctor Who. There's plenty about that to really like (I'm particularly excited about the guy doing the voice-over). But the track record here is mixed at best. Let's take a look back at Davies's four previous epic finales, and try to figure out what worked and what didn't. What Worked: When I rewatched the Christopher Eccleston episodes recently, I was struck by how much less predictable they felt than those starring David Tennant. Maybe it's because Eccleston never quite fit comfortably into the world of Doctor Who like his successor did, maybe it's because the creative team was still figuring things out as they went along, or maybe it's just that nobody has yet matched the flair director Joe Ahearne brought to his series one episodes, but there's a mad energy to this two-parter that no later episodes quite match. It's a bit hard to describe concretely, but there's a moment around when the Doctor thinks Rose is dead and morosely allows himself to be imprisoned (before leading a jailbreak, of course) that I got the sense that this really was a show where anything could happen. The series has gotten a little too comfortable over the past couple of series, and though that's made for a more consistent quality of episode I think it's robbed the series of a bit of its magic. What Didn't: This episode throws into high relief two of my biggest problems with Davies. One, it relies heavily on a bunch of trite pop culture references that are almost certainly going to age even worse than the creaky special effects of the classic series. As an American, I still don't really know anything about half of the reality shows Davies was spoofing, and I can't for the life of me find any coherent satirical point in their inclusion. I think they're just there because...well, it's kind of funny, I guess, and it says something about people being lazy. Then there's the fact that the plot doesn't really make all that much sense. The Dalek plan is convoluted — to put it mildly — and a whole bunch of seemingly important stuff (like the Daleks melting entire Earth continents) is brushed aside in the rush to the Doctor's big moral dilemma. At this point, it's a cliche to point out that Rose resolves the plot through pretty much a literal deus ex machina, but that doesn't mean it's not worth pointing out. The Bottom Line: Ultimately, this story did some things Doctor Who had never tried before. Sometimes, there's good reason for that. What Worked: Of all the Doctor Who finales, this is probably the most coherently plotted. The mystery of the void stuff is set up early with the 3D glasses, and a lot of the apparent logical problems (like the ghosts not looking anything like Cybermen) is deftly handled. The nature of the Genesis Ark is a nice touch, there's some amusing character stuff in the relationships at Torchwood One, and the reunion between Jackie and Alt-Pete always gets me, despite my best efforts. I was never a big fan of the special status the series accorded Rose, but I'll admit the conclusion is well handled. The Bottom Line: Honestly, for a story that is essentially one big excuse to pit the Daleks against the Cybermen, it makes a surprising amount of sense and packs a pretty decent emotional punch. This is probably my favorite of the bunch. What Worked: The Toclafane are probably the single creepiest idea in the history of Doctor Who. Just thinking about them weirds me out all over again, so I really have to give Davies credit for that. I have to admit, I hated this story on first viewing, but on a rewatch I realized why it's sort of insanely brilliant — the whole thing is about what it would be like if the Master won. Davies is so audacious in following through on that premise that "Last of the Time Lords" ends up being the most wonderfully perverse episode in Doctor Who history, as you slowly realize even the tiniest details of the Master's plot are meant to hurt the Doctor. What Didn't: Well, there's the fact that President Winters is a really obnoxious parody of Americans (and as a politics nerd, I'm still bothered by the fact that he calls himself "President-Elect", which just makes absolutely zero sense). Davies writes himself into a corner by making the Master's victory such a complete one, and he never really comes up with a good solution. I'm sorry, but the Doctor being restored by the combined faith of humanity is one of the silliest things I've ever seen, even if it is kind of set up by the existence of the Master's telepathic network. And the ultra-ancient Doctor is really too ridiculous for words. The Bottom Line: The Master takes over for two episodes, and Doctor Who goes completely insane. That's actually a pretty compelling way to look at it, I'd say, but I still don't think that excuses some of the just plain silly stuff Davies includes. What Worked: A lot of the setup is pretty strong. Honestly, Davies has always been a lot better at building up to the big payoff than actually delivering on said payoff ("Utopia" is a perfect example of this, as it's pretty much all setup and thus works surprisingly well, delaying the payoff to the finale). Julian Bleach's Davros might just be the best villain of the new series, even if he really isn't given all that much to do. The fate of Donna is actually kind of powerful, but its impact is diminished after all the gratuitous guest stars. The one thing those guests do help do, though, is really hammer home that all the Doctor's friends eventually leave him. So there's that. What Didn't: Charlie Jane said it best with her recap - this is really just one big fan fiction. And it isn't even all that good as fan fiction. It just throws a bunch of unrelated characters together because they happen to have their own TV shows, sets up a pretty tedious moral debate that the Doctor is clearly going to win, and wastes time giving characters entirely gratuitous resolutions when they had already had much better ones (why yes, I am looking at Rose). I really don't like the fake regeneration, as I think it cheapens the whole concept, but that might just be me being cranky. The Bottom Line: While "Last of the Time Lords" is insane, "Journey's End" is just nonsensical. There's a big difference, and I'm not sure what this episode does that any of the previous epics didn't already do. 1. Tell a coherent story. 2. Realize that giant stakes don't necessarily equal giant drama. Davies has made no secret that he tries to make every finale and special more epic than the one before it, and there's been a solid progression of that in the last four finales. After all, we've gone from future Earth in jeopardy to present Earth in jeopardy to present Earth destroyed to entire universe in jeopardy. That last one was a bit of a big leap, but from the title of "The End of Time" I'd guess that he's upped the stakes once again, this time putting all existence for all time in danger. Which is all well and good, but the scope of the threat doesn't necessarily mean all that much in terms of the story's dramatic heft. After all, look at the fourth and fifth Doctor's finales. In "Logopolis", the entire universe is under threat, and the whole thing is completely dramatically inert. In "The Caves of Androzani", the whole thing doesn't really extend beyond a few soldiers, a corrupt CEO, and some gun runners, but it's maybe the tensest four episodes in Doctor Who history because the Doctor is so completely invested in saving Peri. If there isn't a solid personal motivation for the Doctor's actions, the whole thing could become rather painfully abstract and devolve into yet another pseudo-profound moral dilemma. Here's hoping Donna will provide just such a motivation. 3. Lay off the pop culture. "Bad Wolf" aside, most of this has been limited to the opening post-crisis flip through the TV channels. It's relatively unobtrusive, I guess, and I suppose I don't really have anything against Richard Dawkins having a cameo on Doctor Who (although everything I've learned about Ann Widdecombe suggests I should have a problem with her putting in an appearance). Even so, I'd sort of like David Tennant's swansong to have a more timeless quality. It's kind of a shame that Christopher Eccleston's final appearance will forever be linked to Big Brother. 4. Come up with a coherent reason for all the guest stars. Again, I won't spoil it for people by naming specific characters, but characters are coming back. A lot of them. And it would be nice for there to be a better reason behind it than a thinly veiled excuse for Captain Jack to flirt with Sarah Jane Smith (although that was admittedly kinda awesome.) I actually think "The End of Time" has a shot at pulling this off, as it might in part be a lyrical look back on the Doctor's past, which would actually somewhat justify all the guest appearances. Such an approach requires a fairly deft hand, though, and Davies' strengths have generally been the polar opposite of subtlety. 5. Make it actually possible for the Doctor to resolve the conflict. In "Parting of the Ways", the Doctor was sidelined in favor of Bad Wolf Rose, but then he had already shown he wasn't going to do anything to stop the Daleks. (This was somehow considered a good thing.) The "other" Doctor has to make the hard decision to destroy the Daleks in "Journey's End", which the real Doctor then kind of illogically excoriates him for, banishing him to a human life with Rose. (Not that anyone was complaining, but still.) "Last of the Time Lords" is just a little too batshit insane for me to really tell you how the Doctor resolved that one. I mean, I kind of understand it, but I think I go slightly mad every time I try to think about it. That just leaves "Doomsday", in which he does actually solve the story's big problem. The reason the void stuff solution works so well is that it's scientific(ish). The Doctor is able to think of a solution that requires action, but doesn't require superhuman action. The threats in "Parting of the Ways" and "Journey's End" were just too big for him to really be capable of fixing. They're the kind of things Superman might be able to solve, but not the Doctor. Obviously, it's harder coming up with crises that a thinking hero can solve, but Davies has done it before, so hopefully he can do it again. Ultimately, I'm going to watch "The End of Time", and unless it's a complete train wreck I'm probably going to enjoy it. (And even if it is, I'll probably still enjoy it, just on another level.) Like so much of Davies's tenure, I'm guessing it will be frustrating but largely enjoyable. But here's hoping that he can learn a few lessons from his previous forays into epic storytelling and deliver a swansong that's worthy of his best moments with Doctor Who.